A folklore-based fantasy/horror novel for young adult readers. "There's hidden places all over this land—old, old places. Places with a chain to them for to chain up the wolf when it's time." "Your shadow," Maddie stammered, pointing to the ground behind him. "It moved. Moved by itself. I saw it." The carver turned to look, and she looked, too. His shadow was exactly like hers, thin and gray in the overcast evening. Maddie blushed hotly, waiting for him to laugh at her. But the young man didn't laugh. He just watched his shadow for a minute. When he straightened up and faced her again, his green eyes were wary. "Are you going to tell the others?" he wanted to know. A mysterious young man has come to a small Highland town. His talent for wood carving soon wins him work at the castle and the admiration of the weaver's daughter Maddie. Fascinated by the silent carver, she sets out to gain his trust, only to find herself drawn into a terrifying secret that threatens everything she loves. There is an evil presence in the woodcarver's life that cannot be controlled, and Maddie watches her town fall under a shadow. One by one, people begin to die. Caught in the middle, Maddie must decide what matters most to her—and what price she is willing to pay to keep it. 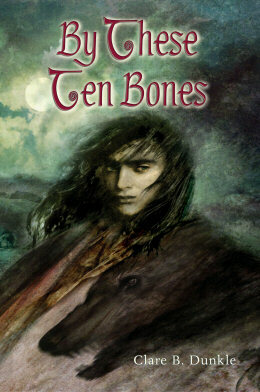 Buy BY THESE TEN BONES in paperback. 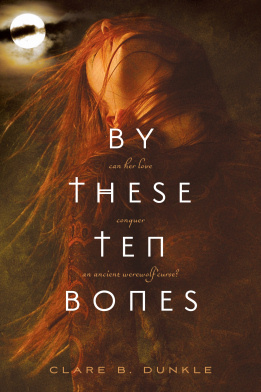 Buy BY THESE TEN BONES in Kindle edition. Shortlisted for the 2006 Mythopoeic Award for Children's Literature. "In this strong-boned fantasy, the Scotland of the Middle Ages comes to full and vibrant new life around Maddie, who lives wholeheartedly within the limited compass afforded her. ... Dunkle's superb treatment of such a violent, desperate character and the straightforward young woman who loves him is what makes this novel the success it is." "Spine-tingling ... Dunkle creates a menacing atmosphere for this chillingly good tale. Readers will cheer Maddie on as she wrestles—and conquers—her deepest fears." CLICK HERE FOR A HIGH-RESOLUTION BOOK JACKET IMAGE FROM THE HARDCOVER EDITION. CLICK HERE FOR A HIGH-RESOLUTION JACKET IMAGE FROM THE PAPERBACK EDITION. Hardcover jacket art and webpage background copyright 2004 by Greg Spalenka. Hardcover jacket design by Amy Manzo Toth. Paperback photograph copyright 2010 by Jaroslaw Datta. Paperback jacket design by Rich Deas. Book excerpt may or may not appear on printed book jackets. Excerpt copyright 2005 by Clare B. Dunkle. Text and image courtesy of Henry Holt & Co.